(CBS/AP) BENGHAZI, LIBYA - Ambassador Chris Stevens was wounded but still alive when Libyans stumbled across him inside a room in the American Consulate in Benghazi, pulled him out and drove him to a hospital after last week's deadly attack in the eastern Libyan city, witnesses said. Fahd al-Bakoush, a freelance videographer, was among the Libyan civilians searching through the consulate after gunmen and protesters rampaged through it last Tuesday night. CBS News correspondent Charlie D'Agata reports cell phone footage taken by al-Bakoush shows Libyans removing the body of Stevens from the scene that night. Several men pulled the seemingly lifeless form from the room. They saw he was alive and breathing, his eyelids flickering. Though they took him to be a foreigner, no one recognized him as Stevens, al-Bakoush said. One man touched his neck to feel for a pulse, and several cried out, "God is great," though it is unclear if that was in response to Stevens being found alive. There were calls for anybody who knows first aid. Abdel-Qader Fadl, a freelance photographer who was with al-Bakoush at the scene, told the Associated Press that Stevens was unconscious and "maybe moved his head, but only once." "We were happy to see him alive," Ahmed Shams, a 22-year-old arts student, told the AP. "The youth tried to rescue him. But there was no security, no ambulances, nothing to help." Al-Bakoush told D'Agata that Stevens was rushed to the hospital, where he was later pronounced dead. To watch D'Agata's report for "CBS This Morning" click on the video player below. Last week, the doctor who treated Stevens told The Associated Press that the ambassador was nearly lifeless when he was brought by Libyans, with no other Americans around, to the Benghazi hospital where he worked. He said Stevens had severe asphyxia from the smoke and that he tried to resuscitate him with no success. Only later did security officials confirm it was the ambassador. There have been disagreements about the attack on the consulate's offices in Libya and whether they were spontaneous expressions of rage over a blasphemous video, or a pre-planned assault that may have taken advantage of the tumult brought about by the demonstrators. The president of the Libyan National Council said the attacks not only look premeditated but that they took months to plan. "It was planned, definitely, it was planned by foreigners, by people who entered the country a few months ago, and they were planning this criminal act since their arrival," President Mohamed Magariaf told Bob Schieffer on "Face the Nation" Sunday. On the same program, however, America's Ambassador to the U.N., Susan Rice, said that the U.S. has no evidence proving that the attacks in Benghazi were premeditated. "We do not have information at present that leads us to conclude that this was premeditated or preplanned," Rice told Schiefffer. She said that based on the best information available to date, "spontaneous protests" began outside the Benghazi consulate after demonstrations erupted in Cairo about the anti-Islam movie trailer. 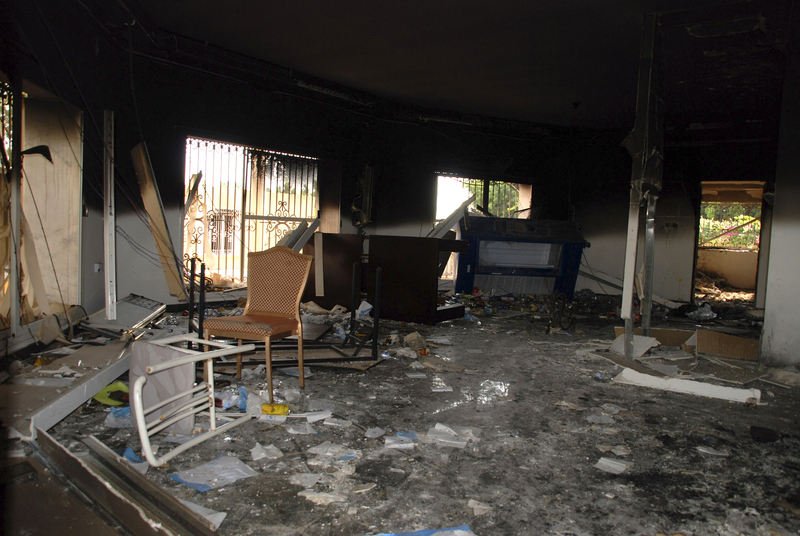 D'Agata, who toured the safe house in Benghazi, said the site shows signs of a well-equipped assault. "We saw evidence of heavy weapons at the safe house, other mortars and weapons, that take a level of expertise to deploy that accurately," D'Agata said. That suggestion was raised by Sen. John McCain on "Face the Nation" Sunday, when he disputed Rice's statement, pointing out that those who attacked the U.S. diplomats used heavy weapons and "pretty good tactics - indirect fire, direct fire - and obviously they were successful," adding, "Most people don't bring rocket-propelled grenades and heavy weapons to demonstrations."